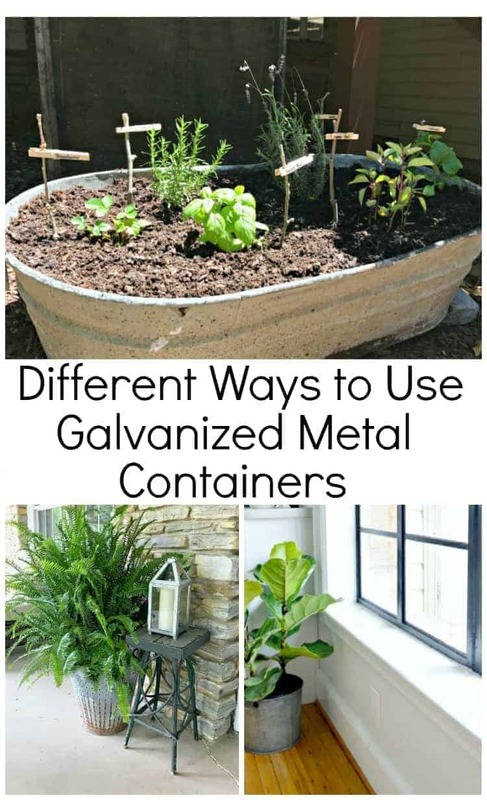 Using galvanized metal containers around the house. Since we moved into our stone cottage, my decorating tastes have changed. I think that it’s a natural progression, tastes change, but I also think the style of our house had something to do with it. If I had to use three words to describe my style right now they would be rustic, cottage farmhouse. 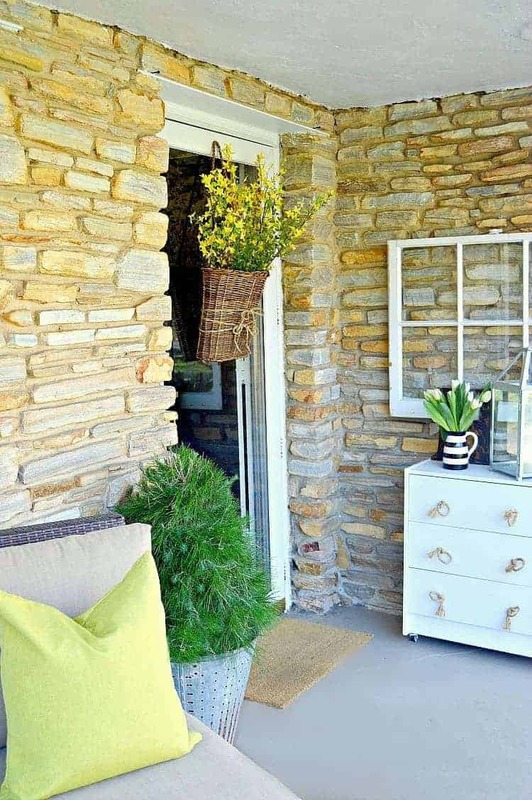 I still lean toward a clean and simple style, but I think our 1946 stone cottage, and all of it’s rustic charm, has rubbed off on me. One good example of my changing style is my use of galvanized metal containers around our house, both inside and outside. It’s a pretty popular trend right now and you can find them almost everywhere you go. I’m finding myself drawn to slightly rusty containers that you find at flea markets. A little rust and a dent here and there is fine but it has to be sound enough to hold a plant (or small herb garden), my preferred way to use them right now. What started this mini obsession was a beautiful large olive bucket that I found at an Illinois flea market. It’s one of my favorite things and it’s always out where I can see it. I kept it on the front porch all winter long with a mini evergreen in it. Once spring rolled around a Kimberly Queen fern (my favorite summer plant) took up residence. Another flea market find was a large galvanized metal tub. A few holes drilled in the bottom for drainage, potting soil and herbs, and I have my own mini garden. 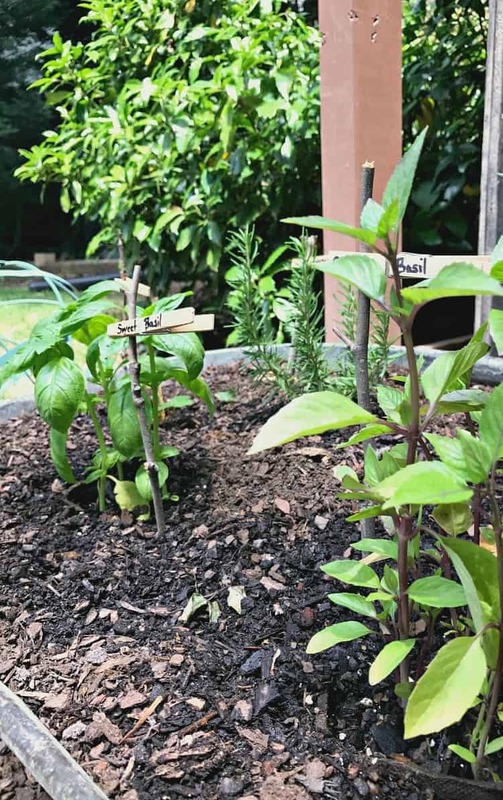 I even added my DIY garden markers, so I know where everything is as it grows. The trough is a little beat up but that’s part of it’s charm. This is my test garden (to see what does well) and I like that I can have everything together. Hubs has a tomato garden and wouldn’t let me put herbs in it so this was my solution. My latest flea market find that I’m using inside is a small galvanized bucket I’m using for Leo, the fiddle leaf fig. It’s simple but I like the contrast of the old metal and the green leaves. Plus it was the perfect size for our Leo. Although I did plant right in my trough, which has holes drilled in the bottom, I like to take care so that my galvanized metal lasts. The olive bucket and the small bucket that holds the fiddle leaf fig have a plastic plant liner to keep them protected from water. The plants are also planted in separate pot, which makes them easier to take out to water. 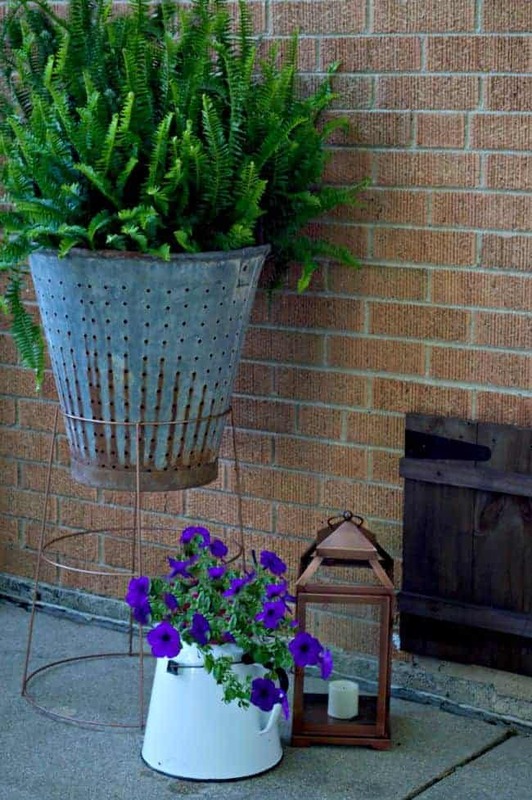 I do love a great, rusty bucket to hold a plant but there’s so many other ways to use galvanized metal. We found the cutest little shop in South Carolina last month and they had a lot of cool pieces made with galvanized metal. I loved the mix of the old wood and the metal in this table. For a moment I thought about bringing it home for our front porch. An awesome piece! 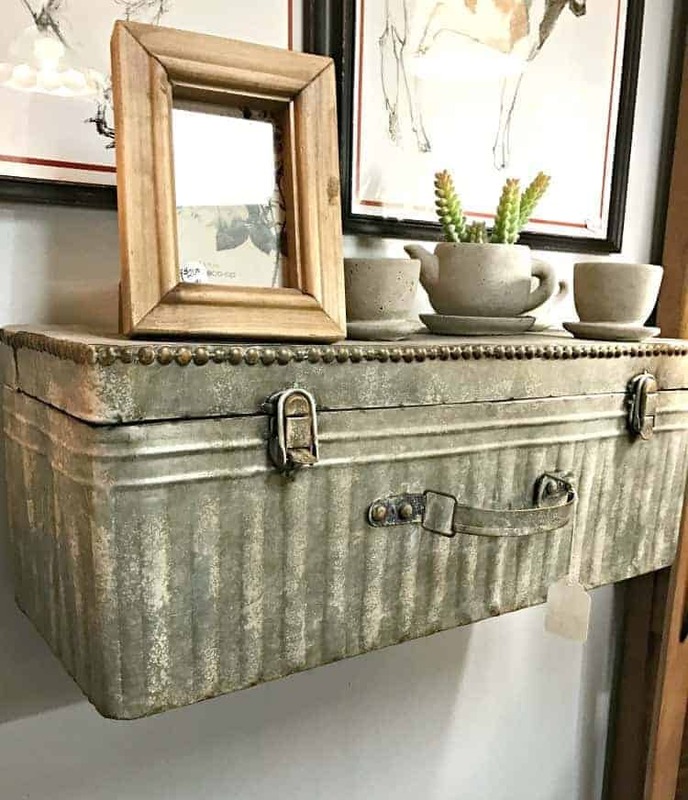 This old galvanized metal trunk turned shelf caught my eye as well. It’s a great way to reuse and showcase an old piece. 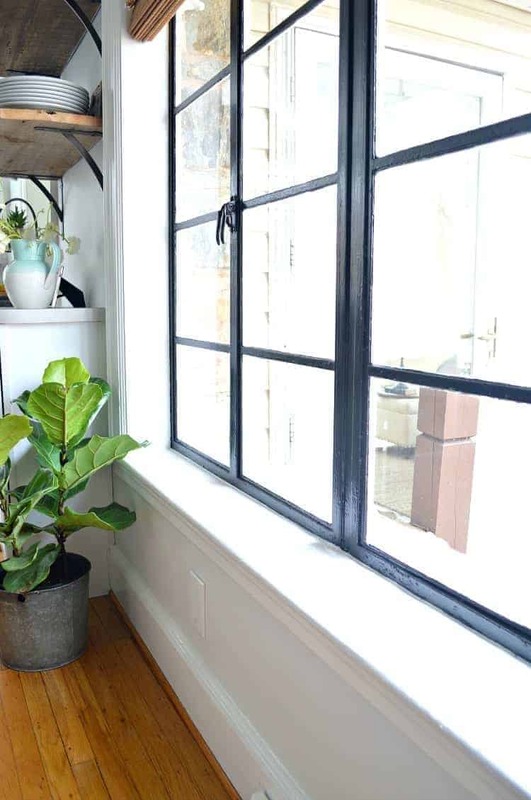 How do you feel about decorating with galvanized metal? Check out another way I used my much-loved olive bucket. And how I use a galvanized metal container to organize my kitchen supplies. All fab ideas! Thinking of using a few tubs in our backyard. I have loved anything galvanized pretty much all my life! How I wish I had my parents galvanized washtub they had when I was a little one. I remember bathing the dog in it, filling it with water in the summer, and sitting in it in my swim suit to cool off, and we used it for a Halloween party to bob apples in…for everything and more we used that old galvanized tub. We have an outdoor kitchen, and had galvanized countertops made for it, and found galvanized farm style lights, and ceiling fans on clearance from several high end home decor stores. We used corrugated galvanized roofing for the interior ceiling of the outdoor kitchen as well. 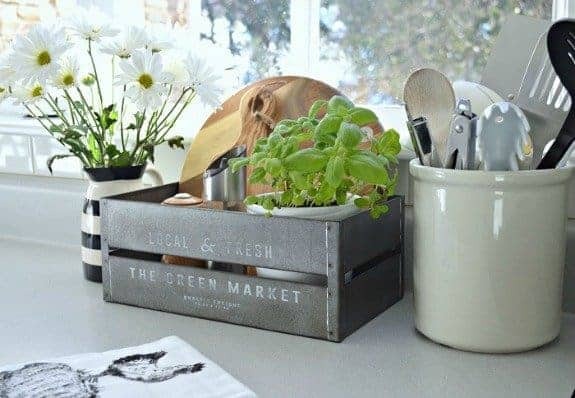 I also love galvanized trays, and have them in all sizes, to use on coffee tables, kitchen table, and a small one to hold oils, sea salt, and a few cutting boards on my countertop. 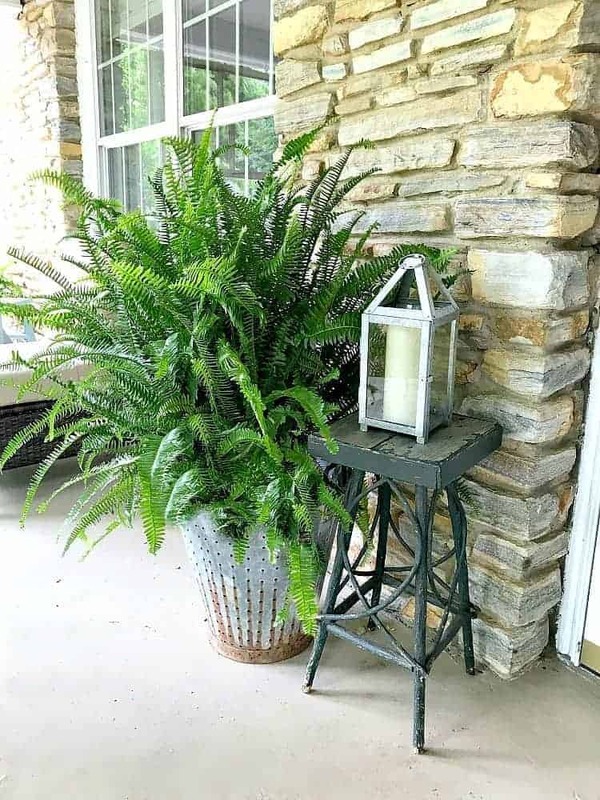 I’m always on the lookout for galvanized buckets, and have several outside as doggy watering stations, and a few to haul small garden tools, and to water plants. Wow Sharon, you do love everything galvanized. 🙂 Sounds like an awesome outdoor space and some great ways to use galvanized metal. Thanks for sharing! I love to hear how my readers create their own beautiful spaces. Just this weekend I found a double washtub stand at an auction! Thinking of plants but didn’t want to ruin the tubs (they are in excellent condition). I’m thinking herb garden and leave in individual pots as mentioned above. Thanks! 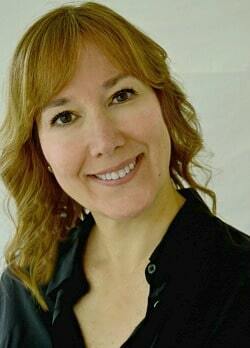 Good for you, Cathy! 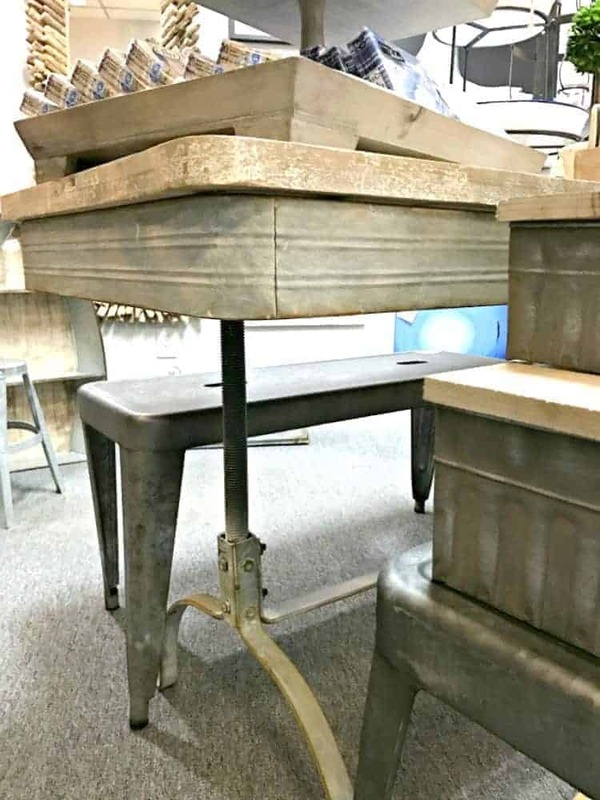 I’m sure you’ll put your new washtub stand to good use. I was leery of putting dirt right in my trough but there was really no way around it. I probably could put some kind of liner in it. Maybe next year. I’m definitely glad, though, that I didn’t plant right in the olive bucket. Happy planting! Enjoy your new find! Your use of the galvanized metal is very nice. 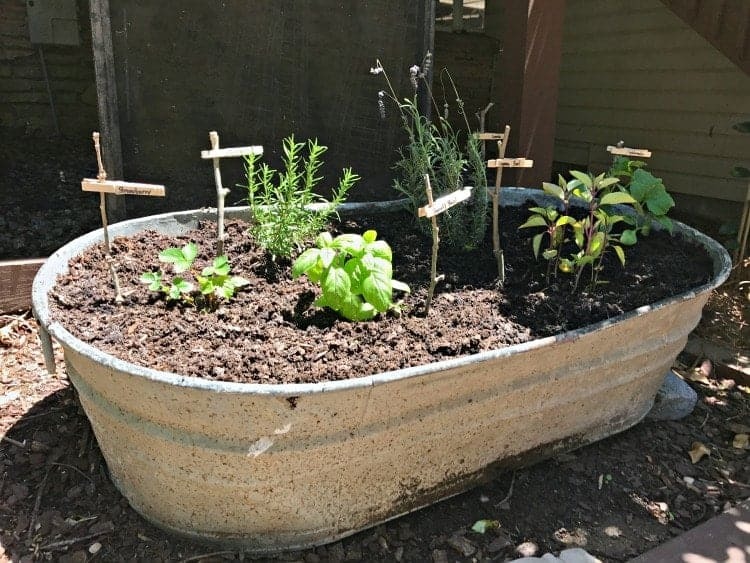 I normally only use it outside and would love to have one of those tubs to use for my herbs. I keep trying different planters for them and have never hit on just the right one. I think the tub would probably be just what I need. I’ll have to look a little harder this summer and fall to find one for next year since my herbs are already growing just fine. Isn’t it nice that it’s time to plant and watch things grow? It seemed like such a long winter even though it was a rather mild one. Oh , I am loving the metal too. I have even considered doing one wall in our dining room with sheet metal. We are putting on a new big deck this year and I am planning on using the big watering troughs for an easy garden. For your hubbies tomatoes there are some companion planting herbs and flowers that actually help protect the tomato plants 🙂 By the way, love your front porch so much we are using it as a model for my daughters apartment patio which is about the same size. Hope you have a great week! I appreciate your visit and support. I love your olive bucket Kristi. I was very jealous when you showed it the first time. The galvanized buckets bring back a lot of childhood memories for me but they do not fit my style. 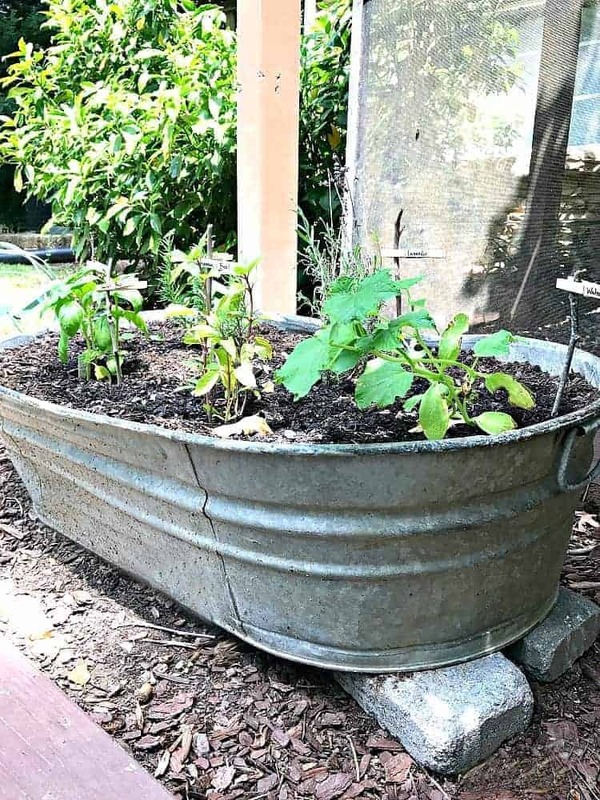 I have thought of using the galvanized wash pan as a herb garden on the patio. I also have galvanized bait bucket my husband found. He liked anything to do with fishing. I would love to visit that store. Looks like a lot of good ideas. How’s your house coming along? All is well, I hope.